1... About the saturated fat and cholesterol in turkey: Is turkey high cholesterol? 2... The concentrations of saturated fat and cholesterol in turkey - for each type of turkey meat. 3... Preparing and presenting your turkey the low cholesterol, low saturated fat way. Some useful tips and hints. It's Christmas or another festive day, there is a high cholesterol problem and you desperately want to know the amount of cholesterol in turkey. The good news is that the cholesterol in turkey is on the low side as far as meat is concerned. The other good news is that the cholesterol in turkey will only potentially affect 25% of people with elevated cholesterol. This is because of the way most people's liver is able to stop cholesterol from being absorbed from our turkey - or any other food. So, for most of us, the cholesterol in turkey will be irrelevant. The bigger issue is the amount of saturated fat in turkey, this is because our bodies convert the saturated fat of turkey - or any meat - into blood cholesterol, pushing the bad cholesterol levels higher. The good news, the saturated fat in turkey is also on the low side for a meat. 2... The saturated fat and cholesterol in turkey - for each type of turkey meat. 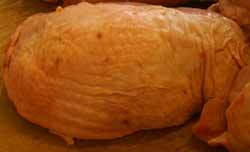 Cholesterol in turkey ham, cured TURKEY THIGH, is 32 milligrams; the saturated fat in turkey ham is 1 gram. For a serving size of 2 slices / 57 grams, 75 calories. Cholesterol in turkey loaf, breast meat no C, is 17 milligrams; the saturated fat in turkey ham is 0.2 grams. For a serving size of 2 slices / 42 grams, 45 calories. Cholesterol in turkey loaf, breast meat with C, is 17 milligrams; the saturated fat in turkey ham is 0.2 grams. For a serving size of 2 slices / 42 grams, 45 calories. Cholesterol in turkey patties, battered and fried, is 40 milligrams; the saturated fat in turkey patties is 3 grams. For a serving size of 1 patty / 64 grams, 180 calories. Cholesterol in turkey roll, roast, frozen, light and dark meat combined, cooked, is 45 milligrams; the saturated fat in turkey roll is 1.6 grams. For a serving size of 3 ounces / 85 grams, 130 calories. Cholesterol in turkey, roasted, DARK meat, is 72 milligrams; the saturated fat in turkey is 2.1 grams. For a serving size of 4 pieces / 85 grams, 160 calories. Cholesterol in turkey, roasted, LIGHT meat, is 59 milligrams; the saturated fat in turkey is 0.9 grams. For a serving size of 2 pieces / 85 grams, 135 calories. 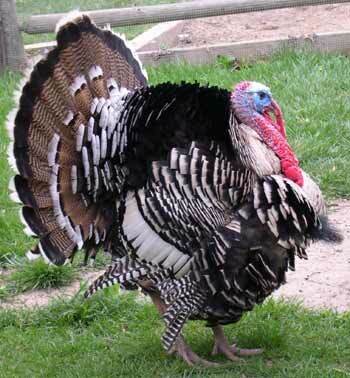 Cholesterol in turkey, roasted, LIGHT + DARK meat, is 106 milligrams; the saturated fat in turkey is 2.3 grams. For a serving size of 1 cup / 140 grams, 240 calories. Cholesterol in turkey, roasted, LIGHT + DARK meat, is 65 milligrams; the saturated fat in turkey is 1.4 grams. For a serving size of 3 pieces / 85 grams, 145 calories. 3... Preparing and presenting your turkey the low cholesterol, low saturated fat way. Some useful cholesterol diet tips and hints. The cholesterol in turkey and saturated fat in turkey given above, is for skin left on and eaten with the meat. After the turkey is cooked, if you remove the skin and give a bit more meat to make up the weight difference, the cholesterol in turkey is reduced by about 33% and the saturated fat in turkey is reduced by about 50%. 2... The saturated fat and cholesterol in turkey fat is absorbed into the stuffing along with the turkey fat during cooking - the stuffing also dries out the turkey meat. Better to use low cholesterol and low saturated fat ingredients in the stuffing and have the stuffing cooked seperate to the turkey and then added to the plate at serving time. To minimise the saturated fat and cholesterol in turkey even further, use low cholesterol and low saturated cooking methods - for example, replace suet in stuffing with shredded potato. Baste with canola oil instead of lard or butter will also help reduce the cholesterol and saturated fats. Even better is to use olive oil, which may help improve the good cholesterol, which then helps the body to get rid of and control the bad cholesterol. Turkey recipes traditionally flavor with one or more of the following herbs and spices: Basil, bay leaf, chives, coriander, curry powder, garlic, ginger, marjoram, oregano, rosemary, sage, tarragon and thyme. Of these, garlic is known to be therapeutic for lowering cholesterol and tryglyceride levels and, ginger may be another possibility.